Minnesota Twins officials have thrown their support behind St. Paul's efforts to build the team a new ballpark. Mayor Norm Coleman had said he needed a commitment from the team before he asked St. Paul voters approve a half-percent sales-tax increase to pay for the project. It's not clear whether the Twins have agreed to work exclusively with St. Paul, but the commitment was enough for Coleman to go ahead with submitting the petitions to put the ballpark question on the ballot. 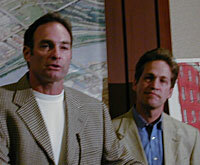 Former Twin Paul Molitor joined St. Paul Mayor Norm Coleman to announce the drive to put a stadium question on the ballot has succeeded. CATERERS GAVE AWAY hundreds of hot dogs and slices of pie today in Rice Park, at a party hosted by St. Paul mayor Norm Coleman to thank volunteers who gathered signatures for a public vote on a ballpark. The referendum would ask St. Paul residents if they want to tax themselves and visitors by raising the sales tax up to a half-percent to cover the city's third of building an open-air stadium for the Twins. Under the mayor's plan, the state would chip in a third and so would the baseball team. Signature-gatherer Ruth Blackman, an avid 71-year-old baseball fan, says she'd love to see baseball in St. Paul, because it's where she lives - and she hates the Metrodome. She estimates she gathered nearly 1,000 of the 10,000 signatures volunteers collected. And she says those who signed had mixed feelings. Blackman: I think it was kind of 50-50. They wanted to get it on there so they could vote no. Other people were very enthusiastic about wanting to sign to have baseball. Actually, Mayor Coleman says polls show public opinion in St. Paul running 70 to 80 percent against public financing for the stadium. He says it'll be a tough sell to turn that around in four months. He says he needed a commitment from Twins owners that they would not use St. Paul to get a higher bid from Minneapolis. Coleman: To fight this uphill battle and not be used as shill or bargaining chip, we need a very clear commitment not to increase the ante from anywhere else. However, while the letter from the Twins appears to put Minneapolis' efforts on the back burner for now, it doesn't rule them out, and neither did Twins' spokesman Dave St Peter when he tried to explain today's agreement. St. Peter: Well, at this time it means we're committed to working with St. Paul. Our objective is to stay in Minnesota, and at this point probably St. Paul is best route to go for us to meet those objectives. A statement released by Minneapolis Mayor Sharon Sayles Belton says she will continue to work tirelessly to keep the Twins in Minneapolis, which she says is a better market for the team. And Minneapolis city councilmember Joan Campbell says just because the Twins say they'll look at St. Paul only for the next four months, doesn't mean Minneapolis is dead. Far from it, says Campbell, because the Legislature is unlikely to contribute state money to a stadium. Put your opinion on the record in the MPR Forum. Eric Jansen covers Minneapolis for Minnesota Public Radio. To provide feedback on this story, please email ejansen@mpr.org. Campbell: We will continue to develop a finance plan that we believe will be far more responsible than going back to the Legislature and asking for $100 million. We've been there, done that. We believe a local solution to this issue is far more likely. The Legislature would also have to approve the half-cent Hennepin County sales tax that Campbell and Minneapolis Mayor Sharon Sayles Belton have proposed. Mayor Coleman says he and the Twins are to iron out a more formal agreement over the next month.